Is it permissible for a lady chemistry teacher to scrunch up her eyes and say, I just lurve you my little bunnies? Can this be tolerated? After reading up on ‘religion’, the reader is asked to ‘CALCULATE how many angels can fit on the head of a pin if each angel is approximately 45mm and faithless’. The textbook itself is a miscellany of short stories, freewheeling between fact and fiction. Beethoven’s ‘Fidelio’ is retold as a ‘blog opera’; both Frida Kahlos are allowed to step out of ‘The Two Fridas’ painting, although one ‘[dreams] in Spanish and the other [counts] in Hungarian’; Flaubert proposes to Maxime du Camp, ‘goes whoring’, and is told to ‘get fucked’ by Louise Colet; Laika, the first dog in space, relates the story of her ‘eve of no return’. 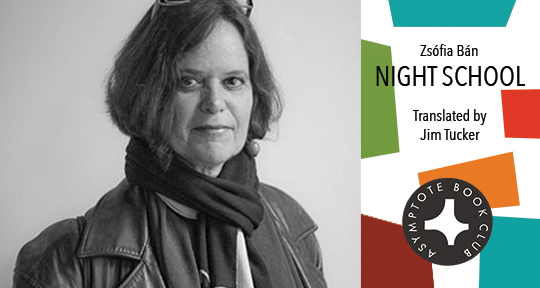 Aside from her fiction, Zsófia Bán is perhaps best-known for her essays on imagery and visual arts: she has written extensively on both Sebald and Sontag, in addition to the role of images and photographs within the context of cultural memory. 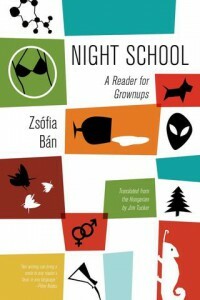 Each section of Night School is illustrated, but the images are a world away from the grainy, enigmatic black-and-white visuals you’d expect to find in a Sebald novel. In the ‘religion’ section, we find an image of a dog in a skirt, staring wistfully up towards the camera, while a page on Maxime du Camp and Flaubert is illustrated in the style of South Park. Rather than Sebald or Sontag, Night School recalls Andy Warhol. Literary and pop culture icons are redrawn in brighter, bolder colours, with a healthy dose of irreverence towards the narratives that bind together societies. the entire company of gods bore witness to us drinking, licking, sucking the manna out of each other to the very last drop, like hungry jackal pups, then again and again until the storm subsided. In several stories, the great white male cultural figures of the past are re-examined with a healthy mixture of respect and scepticism: in addition to the lascivious Flaubert, we’re offered a pompous version of Longfellow (‘Henry, the national poet, writes verse like a bird sings . . . It hits Henry hard that people think just anyone can write poems’), and a continuation of Dangerous Liaisons via email. Zsófia Bán’s textbook parody is a bravura performance, and perhaps it has more to teach us than we might initially think.